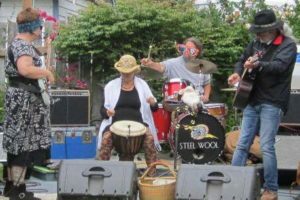 STEEL WOOL is Acoustic Rock Reborn. They’re Upbeat and Happily Serious! STEEL WOOL is a harmony loving, acoustic rock band spinning on the edges of funk, rock, folk and traditional Zimbabwean mbira music. Family friendly, too! Featuring Tim Mueller as songwriter, lead vocalist and guitar player; TR Kelley on bass and vocals, Nel Applegate on mbira, djembe, percussion and vocals, and Randy Hamme on drums, this Eugene, Oregon band moves the heart and soul with stories of truth and joy and love and loss, and catches fire with three part harmonies, the haunting mbira, inventive bass lines, dance-able grooves and world beat percussion. 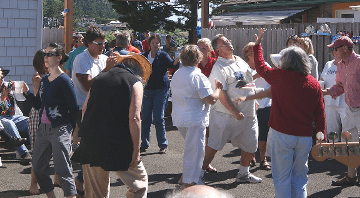 Steel Wool Band has played at the Yachats Underground Pub & Grub several times, including July 4th, 2018. Visit the Band online for more information about this awesome act.